Stripped-down production and intricate arrangements let Red Baraat get the party started on Bhangra Pirates. 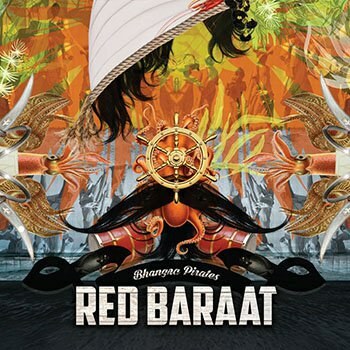 Longtime fans of Brooklyn-based bhangra fusion party band Red Baraat will recognize each infectious track on Bhangra Pirates. In addition to being performed live, most were found on 2015's Gaadi of Truth, with the exception of "Tunak Tunak Tun", a cover of a song made popular worldwide by Daler Mehndi's viral YouTube music video. Red Baraat has covered it for years, too. On Gaadi of Truth, the songs themselves are solid, and the band's technique good, but on Bhangra Pirates, good becomes great as the production is stripped down (the recordings are largely touched-up mixes of past performances on KEXP) and the instruments -- guitar, percussion, and most especially that signature brass -- get much-needed room to explore their respective dynamic ranges. It makes for more dramatic moments, exactly the band's forte. Saxophone-heavy "Rang Barse" stands out as a perfect example of what the group can do with so much space, varying speed, and tone for seven twisting minutes. It’s a true odyssey, and one in good company among other long and layered tracks like the hotly exuberant "Zindabad" and full-speed "Akhiyan Udeek Diyan". Each track is packed with tight, precise intricacies, but never weighed down by them. Instead of acting as burdens, the complexities only encourage the musical flow and the back-and-forth between the band’s eight members, color upon color in a brilliant design. There are also tracks with a little more crowd-pleasing punch, with simple lyrics ideal for audience singalongs. On "Bhangra Pirates", the group throws all cares to the wind: "Do what you want cause a pirate is free / Take to the sea, get some booty booty." On go-go-inspired "Gaadi of Truth", band members call for more horn, and "Se Hace Camino" features a heartfelt Spanish-language chorus repeated over mariachi-esque horns. By the second iteration of any chorus, the words are locked in your mind and falling out of your mouth, and you’ll be relishing the joy in every syllable. Clearer production makes it easier for each of Red Baraat’s chosen musical styles to stand out as they blend together. Jazz, funk, and rock and roll all play important parts on Bhangra Pirates, and it’s clear early on the album, even to newcomers, that Red Baraat is less about sticking to a genre than to doing what makes the whole band - and the whole audience -- have a genuinely great time. There’s more than enough to smile about here, between sharp technique, strong mood, and exciting melody, and Red Baraat never dumbs it down just to make things easier, one of the foremost qualities that set them apart as a band worth getting the party started for. To translate stage energy onto a studio album, especially for a band that thrives on human energy as much as Red Baraat, is no easy task. Bhangra Pirates is the most successful attempt to package that energy yet for Red Baraat, ecstatic and frenzied, turning each individual listening at home into a full audience. It’s as close to a live performance as it could possibly be, and while nothing will ever hit the highs of seeing Red Baraat play in person, the group’s latest hits with fantastic force, and riding its funky wave feels very, very refreshing.